Gain a 50% better yield than you get from standard flat paper voidfill. The incredible filling properties of our MaxiFill paper will help keep down your packaging costs. There is no need to invest in expensive machinery with this simple and highly effective solution. The simple dispenser is all you require. 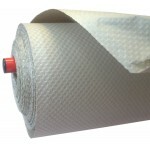 The magic behind this void fill and protective paper is in the fact that it has been specially engineered and has perforations that increase its volume when scrunched. One small paper roll provides up to 10 cubic foot of void fill packaging. The versatile dispenser can simply sit on the floor for portability, or be bolted to a desk or wall near a fixed packing station.